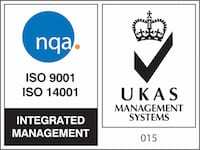 We are proud to have been awarded ISO 9001:2015 and ISO 14001:2015 certification, an internationally recognised standard that ensures we meet the needs of clients through effective business processes. It is our aim to achieve a healthier working environment, which is free of impact to the environment and ill health, and to this end, we will pursue continuing improvements from year-to-year. We will operate in compliance with all relevant environmental legislations, we will strive to use pollution prevention, and environmental best practices in all we do. • Integrate the consideration of environmental concerns and impacts into all of our decision-making and activities. • Promote environmental awareness among our employees and encourage them to work in an environmentally responsible manner. • Train, educate and inform our employees about environmental issues that may affect their work. • Reduce waste through re-use and recycling and by purchasing recycled, recyclable or re-furbished products and materials where these alternatives are available, economical and suitable. • Promote efficient use of materials and resources throughout our facility including water, electricity, raw materials and other resources, particularly those that are non-renewable. • Avoid unnecessary use of hazardous materials and products, seek substitutions when feasible, and take all reasonable steps to protect human health and the environment when such materials must be used, stored and disposed of. • Purchase and use environmentally responsible products accordingly. • Where required by legislation or where significant health, safety or environmental hazards exist, develop and maintain appropriate emergency and spill response programmes. • Communicate our environmental commitment to clients, customers and the public and encourage them to support it. • Encourage our customers to consolidate their purchase orders and deliveries where possible. • Strive to continually improve our environmental performance and minimise the social impact and damage of activities by periodically reviewing our environmental policy in light of our current and planned future activities. • Commit to the protection of the environment including the prevention of pollution. • Commit to meeting all applicable regulatory and legislative requirements relating to our activities. These policies are formed from our Company Strategy and Company Mission. We use these policies as a communication of our intent and to provide the framework for the development of our objectives.